Dr. Abdus Salam: Nobel Laureate in Physics – For Christians, To be Born Again in Islam! A science writer had this to say about Dr. Abdus Salam: “To a Muslim mystic, God is to be sought in eternal beauty. And for Salam, beauty comes thorough finding new, subtle, yet simplifying patterns in the natural world.’ This statement summarizes both his religious as well as his scientific life, in his effort of harmonizing and unifying the basic forces of nature. Dr Salam did not find religion and science incompatible. For him his religious faith and his scientific work were inextricable intertwined. For his scientific work which spans over 40 years, and 250 scientific papers, he found inspiration in the teachings of Islam, his unswerving faith in God, which was the bedrock of his life. Mohammad Abdus Salam (Urdu: محمد عبد السلام) (January 29, 1926; Sahiwal, Punjab, British Raj (present-day Pakistan) – November 21, 1996; Oxford, England) was a Pakistani theoretical physicist, astrophysicist and Nobel laureate in Physics for his work in Electro-Weak Theory. Salam, Sheldon Glashow and Steven Weinberg shared the prize for this discovery. Salam holds the distinction of being the first Pakistani and the first Muslim Nobel Laureate to receive the prize in the Sciences. Even today, Salam is considered one of the most influential scientists and physicists in his country. Salam’s father was an officer in the Department of Education in a poor farming district. His family has a long tradition of piety and learning. At age fourteen, Salam scored the highest marks ever recorded for the Matriculation Examination at the Punjab University. He won a scholarship to the Government College, Punjab University, in Lahore. As a fourth-year student there, he published his work on Srinivasa Ramanujan. He received his master’s degree from the Government College in 1946. That same year, he was awarded a scholarship to St. John’s College, Cambridge University, where he completed a BA degree with Double First-Class Honours in Mathematics and Physics in 1949. In 1950, he received the Smith’s Prize from Cambridge University for the most outstanding pre-doctoral contribution to Physics. He obtained a PhD degree in Theoretical Physics at Cambridge. His doctoral thesis contained fundamental work in Quantum Electrodynamics. By the time it was published in 1951, it had already gained him an international reputation and the Adams Prize. He returned to the Government College University, Lahore as a Professor of Mathematics from 1951 to 1954 and then went back to Cambridge as a lecturer in mathematics. In 1956 he was invited to take a chair at Imperial College, London, where he and Paul Matthews created a lively theoretical physics group. He remained a professor at Imperial until his retirement. During the early 1960s Salam played a very significant role in establishing the Pakistan Atomic Energy Commission (PAEC) – the atomic research agency of Pakistan – and Space and Upper Atmosphere Research Commission (SUPARCO) – the space research agency of Pakistan, of which he was the founding director. Due to Prof. Salam’s influence President Ayub Khan had the Nuclear Power Plant near Karachi (KANUPP) personally approved, against the wishes of his own Government. Salam was also instrumental in setting up five Superior Science colleges throughout Pakistan to further the progress in science in the country. Salam was a firm believer that “scientific thought is the common heritage of mankind,” and that developing nations needed to help themselves and invest into their own scientists to boost development and reduce the gap between the Global South and the Global North, thus contributing to a more peaceful world. Salam also founded the Third World Academy of Sciences (TWAS) and was a leading figure in the creation of a number of international centres dedicated to the advancement of science and technology. In 1964, Salam founded International Centre for Theoretical Physics (ICTP), Trieste, in the North-East of Italy. He was the Director of ICTP from 1964 to December 1993. The Centre has since been renamed to (The Abdus Salam International Centre for Theoretical Physics). In 1959, he became one of the youngest to be named Fellow of the Royal Society at the age of 33. Delivered on 10 December 1979. On behalf of my colleagues, Professors Glashow and Weinberg, I thank the Nobel Foundation and the Royal Academy of Sciences for the great honor and the courtesies extended to us, including the courtesy to me of being addressed in my language Urdu. I am saying this, not only to remind those here tonight of this, but also for those in the Third World, who feel they have lost out in the pursuit of scientific knowledge, for lack of opportunity and resource. Alfred Nobel stipulated that no distinction of race or color will determine who received of his generosity. On this occasion, let me say this to those, whom God has given His Bounty. Let us strive to provide equal opportunities to all so that they can engage in the creation of physics and science for the benefit of all mankind. This would exactly be in the spirit of Alfred Nobel. and the ideas which permeated his life. Bless You! In 1974, when the Parliament of Pakistan declared Ahmadis to be non-Muslims, he left Pakistan for London in protest. Salam died on 21st November 1996 at the age of 70 in Oxford, England after a long illness. His body was brought to Pakistan and kept in Darul Ziafat, where some 13,000 men and women visited to pay their last respects. Some 30,000 people attended his funeral prayers. Salam was buried in the graveyard Bahishti Maqbara in Rabwah next to his parents’ graves. 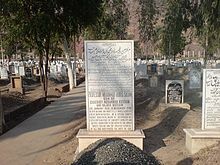 The epitaph on his tomb initially read “First Muslim Nobel Laureate” but, because of Salam’s adherence to the Ahmadiyya Muslim sect, the word “Muslim” was later erased on the orders of a local magistrate, leaving the non-sensical “First Nobel Laureate“. Salam was responsible for laying the groundwork for the Pakistan Atomic Energy Commission, initiating research on problems of waterlogging and salinity, and agricultural research. He played a crucial role in PAEC and SUPARCO, the National Space Agency of Pakistan. He helped Pakistan’s scientists and engineers to be trained in nuclear applications and nuclear science. Abdus Salam’s work in Pakistan has been far reaching and influential. He has made extraordinary contributions to Pakistan’s nuclear, space and missile programs. Therefore, in 1998, the Government of Pakistan issued a commemorative stamp to honour the services of Abdus Salam as part of its “Scientists of Pakistan” series. ” When Dr. Salam was to deliver a lecture, the hall would be packed and although the subject was Particle Physics, his manner and eloquence was such as if he was talking about literature. When he finished his lectures, listeners would often burst into spontaneous applause and give him a standing ovation. People from all parts of the world would come to Imperial College and seeks Dr. Salam’s help. He would give a patient hearing to everyone including those who were talking nonsense. He treated everyone with respect and compassion and never belittled or offended anyone. Dr. Salam’s strength was that he could “sift jewels from the sand” . “Dr. Abdus Salam was responsible for sending about 500 physicists, mathematicians and scientists from Pakistan, for PhD’s to the best institutions in UK and USA“ . A documentary film on the life and science of Abdus Salam is in the works and will be directed by Sabiha Sumar subject to collection of donations valued to $500,000. Salam returned to Pakistan in 1951 to teach Mathematics at the Government College, Lahore. In 1952, he became the Head of the Mathematics Department of the Punjab University. In 1954, Salam went for a lectureship at Cambridge, although he visited Pakistan from time to time as an adviser on science policy to the Government of Pakistan. His work for Pakistan was far-reaching and influential. He was a member of the Pakistan Atomic Energy Commission and work their as a chief scientist with his students, a member of the Scientific Commission of Pakistan, Founder Chairman of Space and Upper Atmosphere Research Commission and Chief Scientific Adviser to the President of Pakistan from 1961 to 1974. From 1957 onwards, he was Professor of Theoretical Physics at Imperial College, London. From 1964 onwards, has combined this position with that of Director of the International Centre For Theoretical Physics, a research institution in Trieste, Italy. Salam had a prolific research career in theoretical elementary particle physics. He either pioneered or was associated with all the important developments in this field. He also served on a number of United Nations committees concerning science and technology in developing countries.. Many prominent scientists, which includes, Ghulam Murtaza, Riazuddin, Kamaluddin Ahmed, Faheem Hussain, Raziuddin Siddiqui, Munir Ahmad Khan, Ishfaq Ahmad, and I. H. Usmani, considered him as their chief mentor and a teacher. Abdus salam played a important and a crucial role in preparing and teaching of future pakistani engineers and scientists in the field of mathematics and physics. Now better informed, in December 1949 Salam went to see Kemmer and asked to be taken on as a research student in theoretical physics. He did not know that Kemmer was already trying to resist pressure from his peers to take him on as another research student – Salam’s examination performance could not be ignored. But with his hands already full with eight other research students, Kemmer did not want any more. He did not expect any newcomer to be as easy to manage as Paul Matthews had been. When he eventually met Salam, Kemmer was still not impressed by the subservient young applicant (‘I nearly refused Salam’, he said later), and suggested that he went instead to Rudolf Peierls in Birmingham. Some ten years before, Peierls had guided Fred Hoyle’s first steps in research at Cambridge, and had later played a key role in the development of the wartime atomic bomb, where he had been among the first to realize just how compact a critical mass of fissionable nuclear matter could be. Salam had been living in Britain for more than three years, but was uneasy about moving to a strange, large city. He knew Cambridge well, and felt comfortable in its great machine of learning. He wanted to do research and live in college, not to have to fend for himself in a place he did not know. In Pakistan, his wife was now expecting a child. Above all, he was confused and depressed after his fruitless tryst with experimental work, his sudden plunge into deep theoretical waters, and the cool reception from Kemmer. After having followed the advice of his colleagues who had told him to move into research, Salam was now angry and frustrated. His Indian contemporary Ram Prakash Bambah recalls Salam alleging that they had ‘misguided’ him, and using ‘very strong Punjabi expressions’ in his disappointments. Salam pleaded with the haughty Kemmer, asking to be taken on ‘peripherally’, and this time was told to go and talk to Matthews. Read more about Paul Matthews. It was Salam’s advice to the President of Pakistan, Ayub Khan, that led to the establishment of the national space agency of Pakistan. In 16 September 1961, Space and Upper Atmosphere Research Commission was established by an executive order. Salam was appointed its first chairman. Salam also appointed Air Comm. Wladyslaw Turowicz, a noted Pakistani-Polish military scientist and an engineer, as Pakistan’s rocket firing head. Abdus Salam knew the importance of nuclear technology in Pakistan. Salam was a central figure in Pakistan’s nuclear program. Abdus Salam was responsible for establishing the nuclear research institutes in Pakistan. In 1972, Government of Pakistan learned about the India’s nuclear weapon program. The then Prime Minister of Pakistan, Zulfikar Ali Bhutto, formed a group of nuclear scientists and engineers, initially headed by Salam. He closely collaborated with his noted colleague and long-associated friend, Mr. Munir Ahmad Khan, in the field of nuclear technology in Pakistan. In December 1972, two theoretical physicists working at the ICTP were asked by Salam to report to noted Pakistani nuclear scientist, Munir Ahmad Khan (late), then-PAEC chairman. This marked the beginning of the “Theoretical Physics Group” or TPG. The TPG, in PAEC, was assigned to develop the theoretical designs Pakistan’s nuclear weapon devices. The TPG team under the leadership of Riazuddin, who is also Salam’s distinguished student, completed the work on the theoretical design of the Nuclear weapon device by 1977. Sitara-e-Pakistan for contribution to science in Pakistan (1959). Abdus Salam International Centre for Theoretical Physics , Trieste, Italy. ^ This is the standard transliteration (e.g. see the ICTP Website and Nobel Bio). Other transliterations include Abdus Salam; see Abd as-Salam for more details. ^ Kibble, T.W.B. (November 1998). “Muhammad Abdus Salam, K. B. E.. 29 January 1926-21 November 1996″. Biographical Memoirs of Fellows of the Royal Society 44: 386–401. doi:10.1098/rsbm.1998.0025. http://links.jstor.org/sici?sici=0080-4606%28199811%2944%3C386%3AMASKBE%3E2.0.CO%3B2-K&size=LARGE&origin=JSTOR-enlargePage. Retrieved 2008-01-05. ^ Philately (1998-11-21). “Scientists of Pakistan”. Pakistan Post Office Department. http://www.pakpost.gov.pk/philately/stamps98/scientists_of_pakistan.html. Retrieved 2008-02-18. ^ Isambard Wilkinson (2007-12-25). “Pakistan clerics persecute ‘non Muslims’”. Daily Telegraph. http://www.telegraph.co.uk/news/main.jhtml?xml=/news/2007/12/25/wpakistan125.xml. ^ “Shahid-ur-Rahman Khan, Long Road to Chaghi(Islamabad: Print Wise Publications, 1999),pp. 37–39. ^ “The Nobel Prize in Physics 1979″. Nobel Foundation. http://www.nobel.se/physics/laureates/1979. Retrieved 2008-09-10. ^ Lauren Caston and Rita Fioresi (October 30, 2007). “Mathematical Foundations of Supersymmetry” (PDF). arXiv. http://arxiv.org/PS_cache/arxiv/pdf/0710/0710.5742v1.pdf. Retrieved 2008-09-10. ^ A. Salam (1966). “Magnetic monopole and two photon theories of C-violation”. Physics Letters 22: 683–684. doi:10.1016/0031-9163(66)90704-9. Azim Kidwai, The Greats in Science from Third World, 1989, Trieste, p20. Ideals and Realities: Selected Essays of Abdus Salam. Editors: CH Lai and Azim Kidwai, Third Edition. World Scientific, 1989. p 468. Ideals and Realities: Selected Essays of Abdus Salam. Editors: CH Lai and Azim Kidwai, Third Edition. World Scientific, 1989. Pages 373-374. Gordon Fraser. Cosmic Anger: Abdus Salam – The First Muslim Nobel Scientist. Oxford University Press, 2008. Page 93.